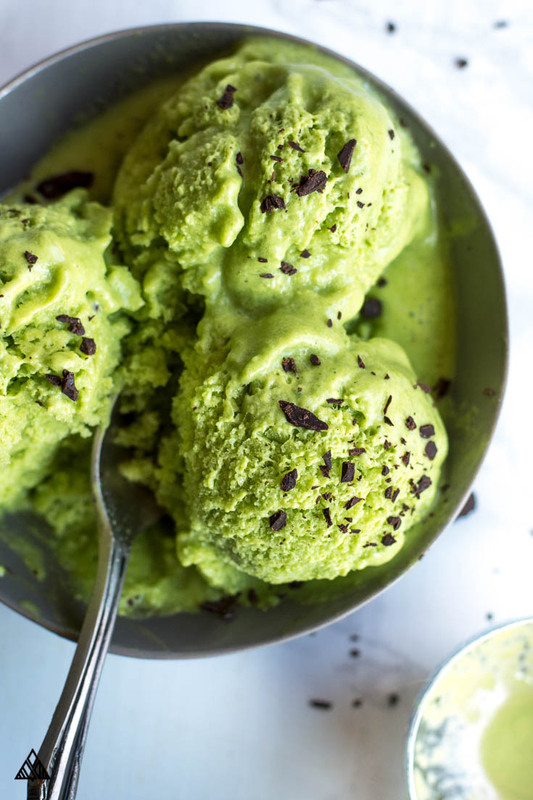 The BEST Sugar Free Ice Cream — made in a blender in less than 10 min! It’s sugar free and low carb ice cream! With an easy sugar free ice cream recipe that’s this delicious, ice cream has officially become the main course in my house! Now let’s get makin’ some ice cream! What are the carbs in ice cream? If you’re sticking to low carb recipes, chances are you’ve already cut out ice cream—but for those that are curious, a ½ cup serving of vanilla has 16 grams of carbs in ice cream. Even light vanilla soft serve has 19 grams of carbs in a ½ cup! That said, this sugar free ice cream nutrition is a little different: only 5 grams of carbs plus 13 grams of protein per serving. That’s right, so balanced I eat it for breakfast! 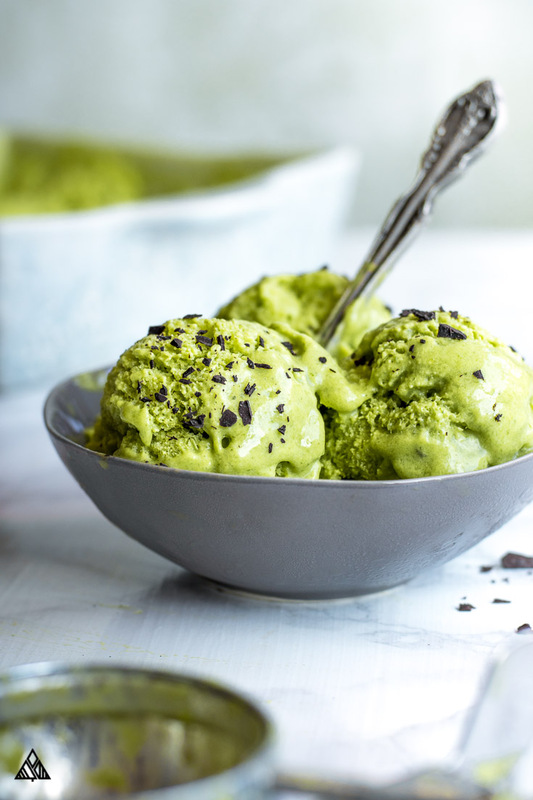 There are a billion ways to make low carb ice cream—but this recipe is completely different from the other ones you’ll find. 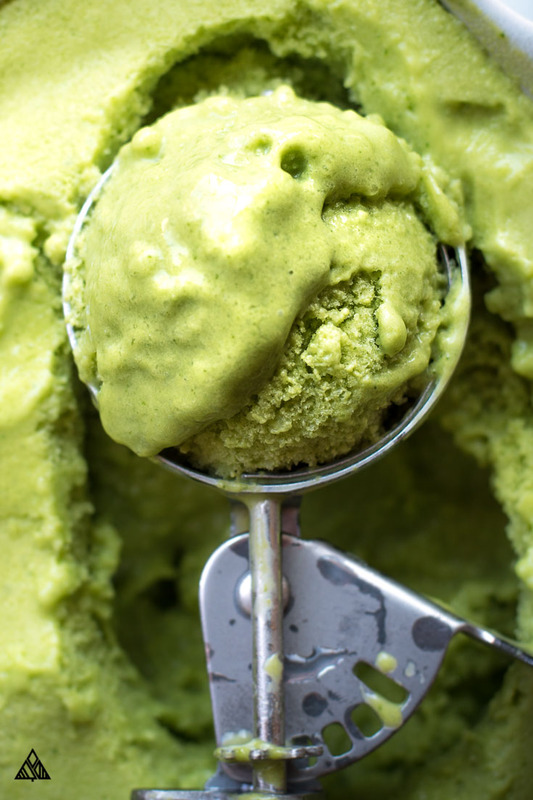 Most sugar free ice cream recipes use tons of butter, eggs and heavy cream to achieve the creamy, fatty flavor and consistency—whereas this sugar free ice cream recipe uses low carb milk (almond milk) and avocado. 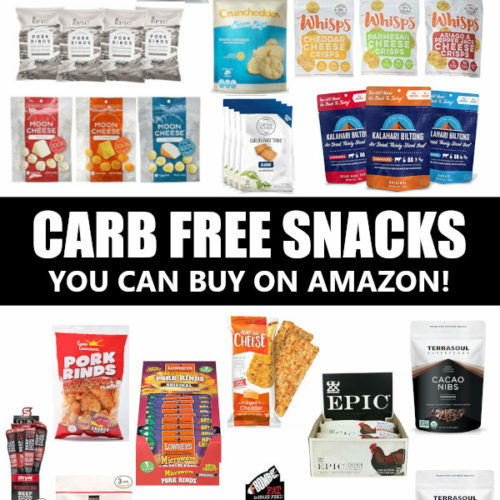 Simple, healthy, low cal and super low carb shopping list ingredients. Use whatever low carb milk you have on hand — check the carb count, as this will change the nutritional value of your sugar free ice cream! You can also add a little heavy cream — just make sure to keep the amount of liquid the same as this recipe. Swap erythritol for one of your favorite keto sweeteners. 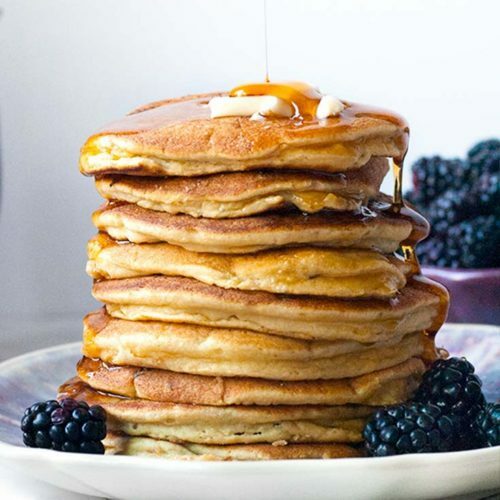 Or, if you aren’t eating low carb, use whatever sweetener you prefer: honey, white sugar, maple syrup. I love adding spinach — leave it out, or swap with some other low carb vegetables if you wish. Fair warning, not all veggies are as discrete in flavor as the spinach in this recipe! What’s so amazing about this low carb ice cream recipe, is that you can eat it straight from the food processor! That said, if you’re going for the more traditional ice cream scoop, you may want to let it set in the freezer for a few (give it at least an hour). It’s great to have the ingredients for this recipe handy for those long nights when you’re craving something sweet! 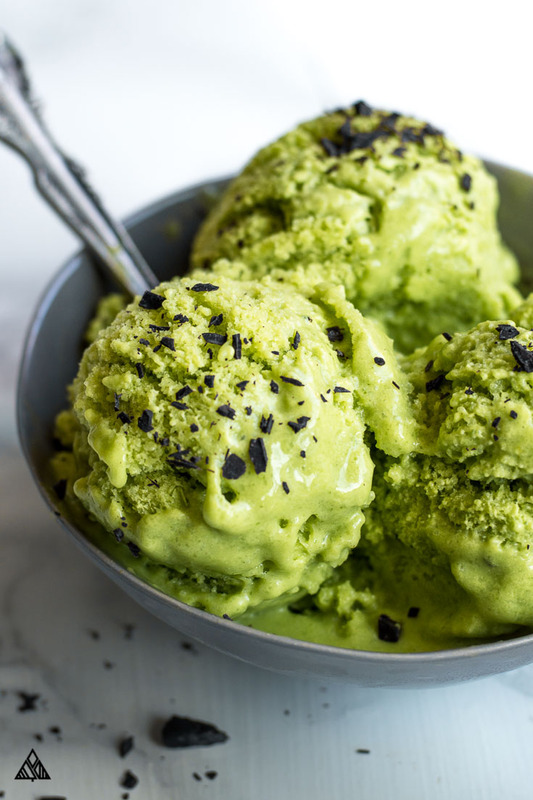 Instead of reaching for the carbs, grab yourself a scoop of this sugar free ice cream instead! keto ice cream recipe Money Saving Tips! 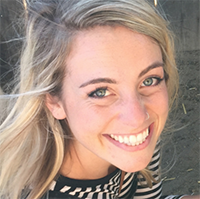 Yes, eating low carb foods carb can be expensive — but there are some work around. 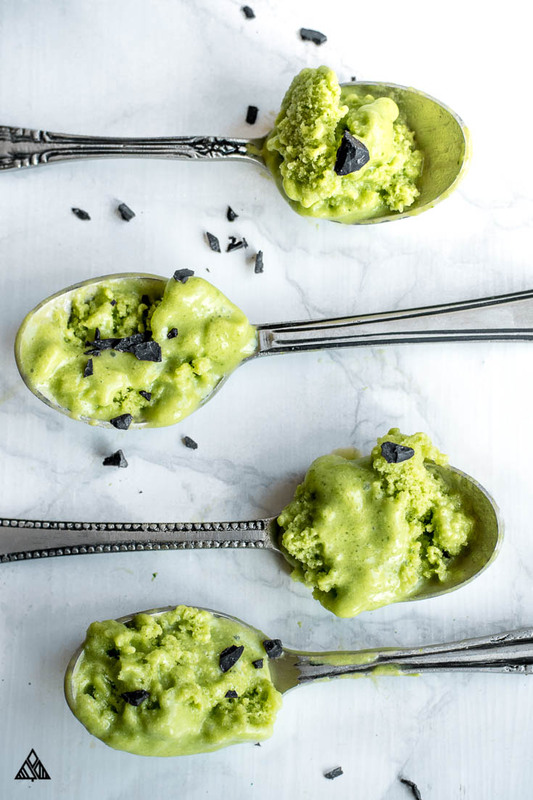 To save money and stick to my low carb meals, there are a few items I always have handy in my pantry—low carb protein powder and erythritol are two of them, and both are used to make this keto ice cream recipe! I find buying these ingredient at a regular grocery store is significantly more expensive that purchasing them on Amazon or from Costco. I always buy protein powder from Costco (if they’re carrying the brand I like) or on Amazon — I switch between this vanilla whey protein powder, and this vanilla vegan plant based protein powder. I buy erythritol on Amazon. Rather Buy from a sugar free ice cream brands? As easy as this recipe is, I get it. Sometimes you just want to pick up a sugar free ice cream brands product instead. The only warning I’ll give is for those watching their carbs (and not just their sugar intake) — not all sugar free ice cream carbs are low. For example the sugar free ice cream walmart sells (Great Value brand) has 18 grams of carbs in ½ cup! Breyers sugar free ice cream has a similar carb count. 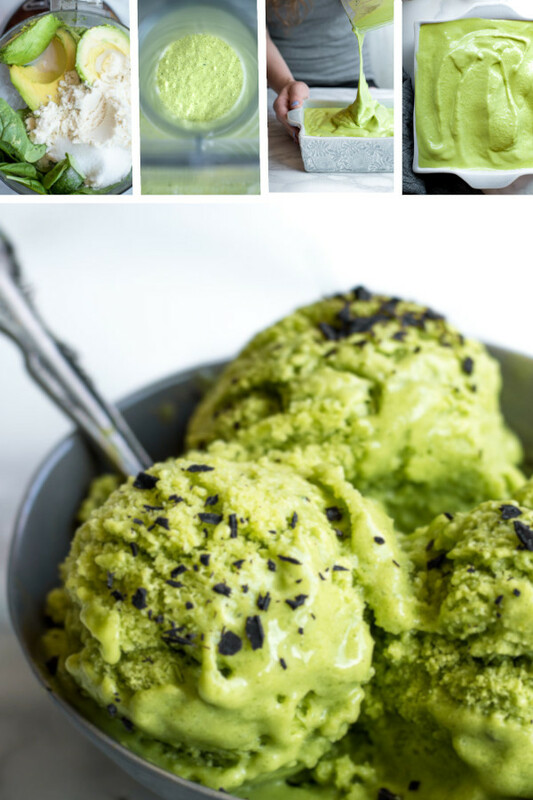 I can’t even wait to hear what you have to say about this sugar free ice cream recipe! It’s one of my favorites, and I have a feeling it’s gonna be one of yours too! Enjoy! This easy sugar free ice cream recipe is the PERFECT sweet and creamy treat for a warm (or cold) day! 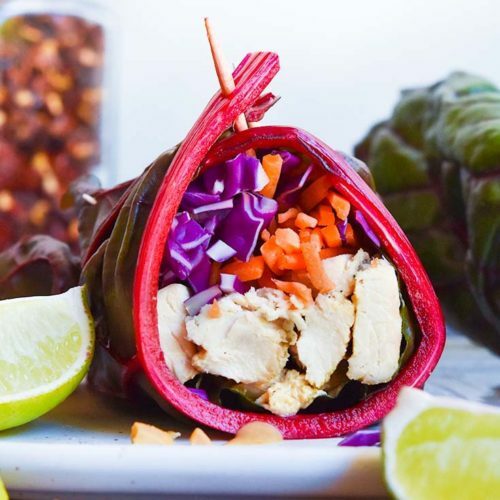 Make it in a blender in less than 10, plus it's vegan and low carb! 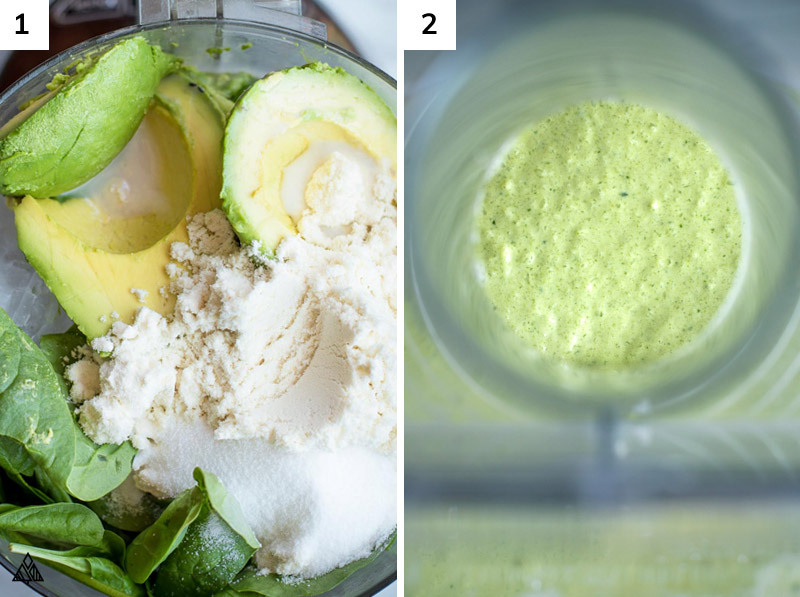 Place all ingredients in a food processor, adding the milk last. Process until everything is a creamy texture and has combined. If you’re craving ice cream now, eat with a spoon. If you’d like to achieve a more ice cream like consistency, pour it into a 9 x 3 bread pan and toss it in the freezer for an hour. Scoop, serve with some low carb chocolate shavings, and enjoy! Prefer a no carb ice cream? 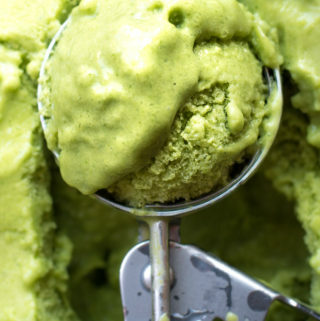 As delicious as spinach and avocado are in this sugar free ice cream keto friendly recipe, I understand they aren’t for everyone. 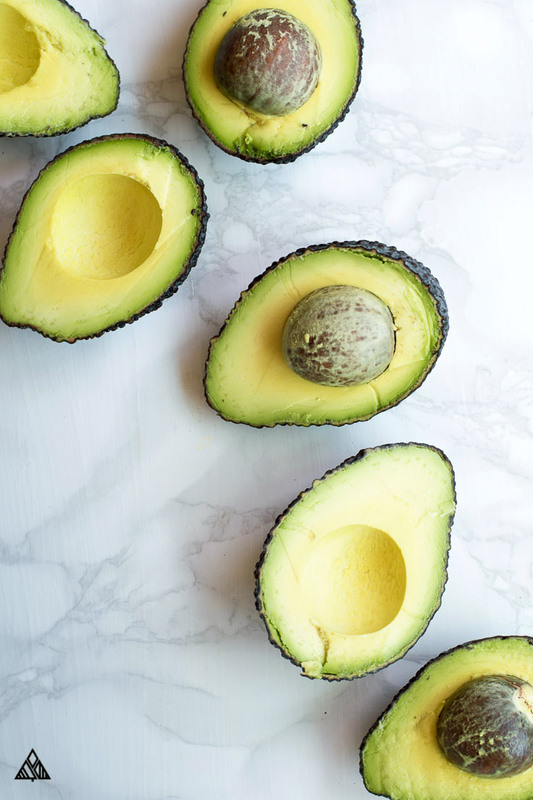 You can definitely skip the spinach and save a few carbs, but skipping the avocado would require a little more recipe testing, as you’ll need something to add that creaminess. I’m currently testing up a bunch of possibilities — check back soon for a list of no carb ice cream recipes! 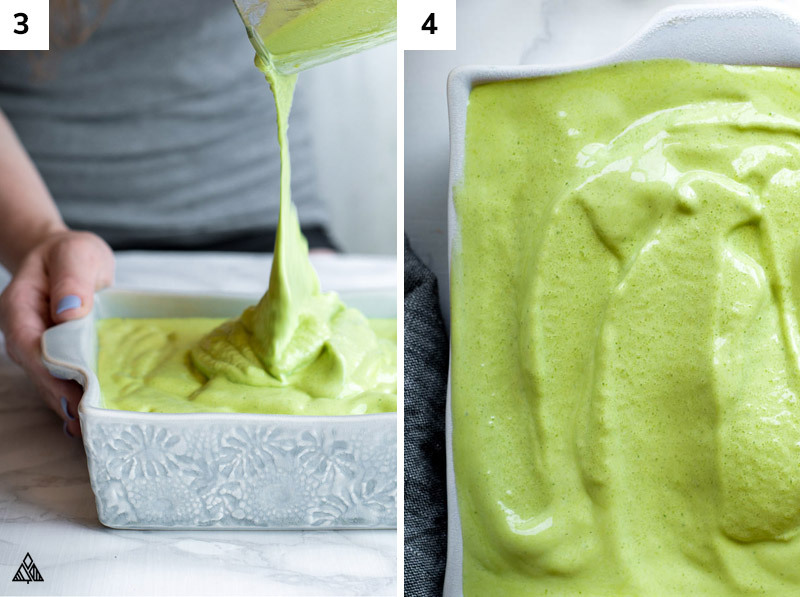 I loooooove Avocado ice cream! I haven’t tried it with spinach! This looks so good!! Thank you!! Thank you SO much Maria <3 <3 You really need to try this!